It might be discount, but is it safe?. Cheap dirt bike accessories can be found easily on the internet or in stores, the question is what you want them for. 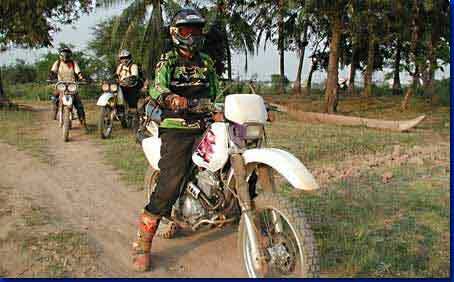 Don't look for the latest hot item if you simply want cheap dirt bike accessories. You'll probably have to settle for the hot look a few years back. You have two options when it comes to purchasing these items cheaply, the first is to purchase used items and the next is to find dirt-cheap new ones. Cheap dirt bike accessories pop up on eBay a lot but you never know the condition of the item unless you purchase from a reputable seller. Normally this type of seller discloses all the problems with the accessories, so you know what you're getting. You want to make sure the safety accessories are truly safe and not used beyond their life of protection. Plan to spend a little more on the helmet and make sure that it will fit properly. There's nothing more uncomfortable and dangerous than a helmet that fits too tight or one that wobbles around on your head. It is simply a waste of money purchasing it. 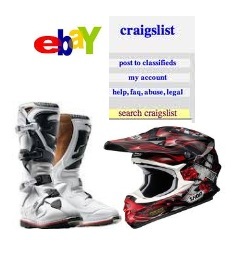 Craigslist for your area allows you to see the cheap dirt bike accessories before you purchase since you normally pick up these items in person. If your area has a large following for dirt bike racing, you'll have the best luck using Craigslist for cheap dirt bike accessories. Of course, you can still find new accessories if you scan the net long enough. Many of the dirt bike sites have stores that sell the various items. Sometimes the manufacturer discontinues a particular style and the site wants to sell off what they have cheaply. Other times, sites pick up a bulk amount of discontinued dirt bike accessories and pass on the savings. Check your local brick and mortar store if you don't mind wearing last year's colors or styles. While you'll find the best bargains at the end of the season, it's hard to adjust for growth, so wait until the new season begins. Since most people do this, you’ll have to be quick off the mark but at least you’ll know these items will fit you until the season ends. If the accessories are for younger racers, the store will normally still have ample amounts of last year's stock – and you can often bargain with the store if they’re having a closeout sale. Cheap equipment maybe a good buy for the novice, just to get you started. Budget clothing can be good too, however in the matter of a helmet, buy new if at all possible and ensure its fitted properly. If it’s too loose the helmet will be no good, and if it’s too tight, it would be a pointless buy. If buying any riding accessories used, check for rips or tears in clothing, and check out internet stores for sales and discounts, as there is many about. When buying cheap dirt bike accessories, ebay is sure to be focused on your shortlist. And we found a couple of bargains, like a Nitro MX422 Junior Dirt Bike / Motocross Helmet for £22! and a set of WULFSPORT MOTO X SCRAMBLER BOOTS for £12.50. But there were much more good quality items for sale - like a pair of FOX F3 PATRIOT MOTOCROSS BOOTS, for £169, good boots but that’s sure to put a hole in your pocket. So anything from dirt bike boots to old dirt bikes can be bought on ebay. Another place for inexpensive pitbike accessory deals is www.dirtbikexpress.co.uk and even www0.uk.shopping.com which try and seek out a bargain basement dirt bike accessory, for you. Or if you want to save time looking in all those small adverts, go straight to some dirt bike dealers like www.slyfoxmx.com, who not only offer discounted and cheap dirt bike accessories, but sales on NEW dirt bike pants and items like the O’Neal 508 Youth Lock & Chain Helmet, for around $50. For something a little pricier they have a Thor Phase Combo, (jersey, pants and gloves) for $153 so they sell anything for the motocross rider. Other general cheap dirt bike accessories we have seen; is the GMAX GM46 Helmet at a sale price of $60, plus FX Factory Numbers - 6 inches tall, in colors of White + Black for $6.60 and a Hammer Youth Chest Protector for $34. So loads of gear and savings, on this type of MX apparel and dirt bike bits for your MX bike. Then to the bikes themselves, now places like slyfox only offer accessories; so your cheap mini dirt bikes, and cheap 100cc dirt bikes should be on ebay and other used classified websites - even biketrader ! But because you have saved so much cash on your accessories there is no excuse not to buy fantastic "used" dirt bikes for sale. You might even spend that little bit extra; safe in the knowledge your cash has been well spent. 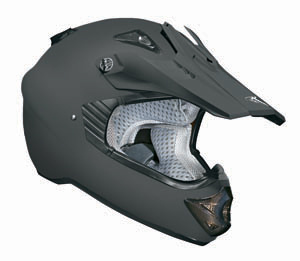 Accessories are an important buy such as a cheap dirt bike helmet, or maybe you'll need a specialized dirt bike part? But even so; ensure the helmet meets rigorous safety standards, and that the part WILL fit your MX bike – as a cheap items no good if there is no inherent quality within it. 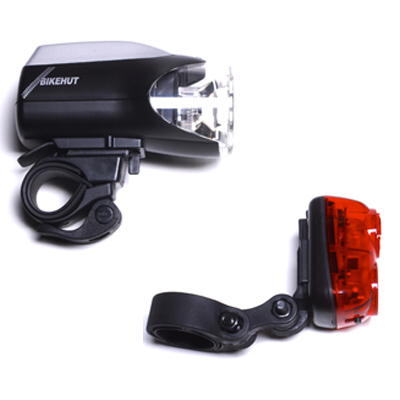 Most stores have a huge range of options from dirt bike lights to inexpensive dirt bike seat covers. Add these bits to your overall budget before buying your bike as they can soon eat up your cash.